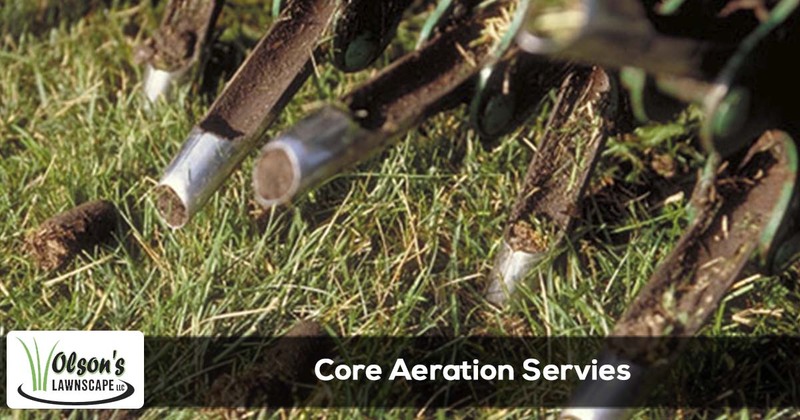 Core aeration is the process of putting 2-3" holes in your turf to help with root development and oxygen exchange. Aeration will help develop the kind of lush green lawn that you and your family can be proud of and enjoy the entire season. And because aeration directly impacts the growth and health of your lawn, there are times that better to have the service performed to get the most benefit from the service. The best time to aerate your lawn is when your grass is growing the most. This usually occurs between May and June depending on the weather and towards the end of August and early September. That is when it is most ideal to have the service performed and when your grass will get the most benefit from the service. So why would you have your lawn aerated other than these times? There are several reasons why you might want to consider having your lawn aerated more frequently or during non-optimal times. To start with a lawn that get more traffic than normal either due to kids playing in the yard or having pets. Athletic fields and golf courses are good examples of this, they get aerated very frequently some several times a month due to the amount of foot traffic they receive. Another reason to consider having your lawn aerated prior to the heavy growing season would be special pricing for early service. Many lawn care companies will offer their current clients specials for allowing the service to be performed during their slower months. About a week after your lawn is aerated, the holes will start to fill with white, actively growing roots. These roots are a good sign that the turfgrass is responding to the additional oxygen, moisture, and nutrients in the soil from the aeration process. Your lawn will be healthier, greener, with less thatch and pest problems than before.